The first phase of a Natural Resource Damage Assessment (NRDA) is pre-assessment. 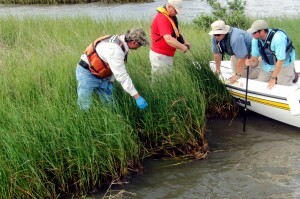 As part of the assessment process, a team of scientists checks for oil in a marsh following the Deepwater Horizon/BP oil spill. In this phase, the trustees determine whether impacts to natural resources have occurred as a result of the spill, chemical release or vessel grounding. This includes collecting time-sensitive data and reviewing scientific literature about the released substance and its impact to determine the extent and severity of environmental damage. Mathematical models may be used to help predict the fate and effects of the spill on natural resources. If resources are damaged as a result of the incident, trustees proceed to the next step of the NRDA process.